Online car buying has officially become a viable market. With more and more consumers buying everything from furniture to housewares to groceries online, it was only a matter of time before someone got the bright idea to sell cars on the internet. But TrueCar is doing more than just selling cars online. They are offering a unique sales model that streamlines the car buying process and attempts to remove the headache of negotiating the cost of your new vehicle. They aren’t the first to try to remove the car salesman, but are they any more successful than their predecessors? Read our TrueCar.com review below and find out for yourself. One of the biggest components of any online retailer is the functionality of their website. Navigability and ease of use are often some of the biggest hurdles an online retailer has to overcome. What’s intuitive to the website designers often isn’t intuitive to the customer. TrueCar has done an excellent job in providing a website that’s easy on the eyes and equally easy to use. TrueCar’s value proposition is that by shopping with them, you’ll get the best price on your new or used car. To reinforce this fact, TrueCar provides pricing information both from dealers in your ZIP code and from people who’ve bought cars in your ZIP code. What you see is a graph showing the difference in pricing, month by month, between TrueCar’s no hassle/no haggle price and the average selling price of the make and model you select. Once you’ve done that, you’re taken to a screen that offers you quite a bit of information. In the bottom center of that page you’ll see how many participating dealers there are in your area and their TrueCar price. So, you’ve read our informative car buying guide – now, you’re ready to buy a car. Let’s look at TrueCar’s buying experience. Did you like the price they offered? Much like buying a used car from CarMax, TrueCar cuts the haggling from the equation. Unfortunately for us, this is where we ran into some snags. First, in order to get the most accurate pricing information, you’re going to have to enter your email. Most consumers may not be fond of this, but after reading their rules on who can contact us and how this email address will be used, we felt okay about giving up our email address. After that, they want you to create your TrueCare guarantee certificate—a document with a barcode on it that you are supposed to print and take to the dealer to get your TrueCar price. The barcode, we assume, is for tracking the sale so that TrueCar gets a cut of the money (which they should. They have to make money somehow). To create this certificate they require your name, mailing address, and phone number. We were even less excited about giving up this information, but we did it anyways for the purpose of writing this review. Once that’s complete you’ll be given a list that shows the cars available in your area and their respective pricing. The dealerships’ names are not revealed at this point, only their distance from your location. This is apparently to keep dealerships from seeing each other’s prices and falling into a “who can offer the lowest price” bidding war. 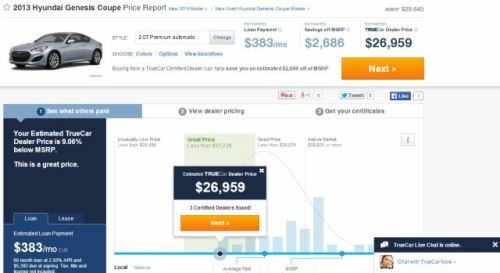 This is a change from how TrueCar used to serve car prices to consumers. There are also icons identifying some of the perks associated with each dealership such as oil changes, car washes, and express checkouts. In fine print and very light-colored text you’ll also see what each dealership is charging for processing fees along with a disclaimer that the price shown does not account for taxes, titles, tags, or these processing fees. Bummer. After that you simply select the dealership with whom you’d like to do business, hit the “next” button, confirm your personal information, and print off your TrueCar guarantee certificate. Take that bad boy down to the dealership along with a check for the guaranteed amount and you’re done. Easy, right? Right now, it seems like TrueCar isn’t going to be for everyone. However, there are plenty of people out there who want to buy a car and want a process that is as painless as possible while also reducing the amount of time a car purchase typically takes. For those people, TrueCar is a godsend. For those of us who want the best price and aren’t afraid to put in the work to get it, TrueCar doesn’t seem likely to be of much use. The prices we got from using TrueCar were, on average, about 10 percent below the manufacturer’s suggested retail price (MSRP). For us, that wasn’t much of a deal considering you can do that well just by looking for manufacturers or dealerships that are offering rebates on the car you want. A good rebate plus some skilled haggling can land you a noticeably better deal. Again, you’ve got to be willing to do the legwork to get a better price. If spending a few days researching these kinds of incentives sounds like too much, then you’re likely to be TrueCar’s target audience.